Our outdoor leaf vacuum range is available as towed or trailed and is ideal for private and commercial uses in large gardens, golf courses, sports grounds, paths and parkland for collecting leaves, grass clippings and other debris conveniently into a collector, ready for composting or dispose of. These commercial leaf vacuum is the perfect machine for maintaining lawn areas in top condition during all weathers and seasons as well as being suitable for using on tarmac and other hard surfaces. 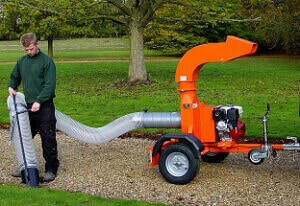 This leaf vacuum trailer is perfect for clearing large areas from leaves, cuttings and debris. Suitable for commercial use, this leaf vacuum has a powerful 9HP Honda engine, mounted onto a two-wheel chassis with an integral tow bar. The best way of using the FGPSU commercial leaf vacuum is to attach it to the rear end of the leaf collector trailer. This leaf collector vacuum can be supplied with a kit to modify your own trailer, or collected by Fresh Group and modified to suit your trailer. The discharge vacuum hose is attached to the rear of the collector trailer, allowing for an efficient and easy waste collection. This leaf vacuum is best used by two people, one acting as the driver and the other one operating the hoover for quick clearing of road edges and other areas effectively. This commercial leaf vacuum chops the leaves through its fan, reducing the trips to the dumping areas, saving you money and time. This leaf vacuum can be used in conjunction with a hand held leaf blower, blowing out leaves from flower beds and awkward areas and then collecting them with the collector trailer. The fan belt of this leaf vacuum is driven and not fitted directly onto the crankshaft of the engine. ​This large capacity commercial leaf vacuum can be towed behind a tractor and is described as twin cut. Tractors have a centre rear discharge, blowing the cut grass/leaves into a limited size collection hopper where frequent emptying is extremely time-consuming and frustrating. The TRCL commercial leaf vacuum has a great capacity so that larger amounts are collected in one fill, speeding up labour and saving costs. The powerful motorised fan unit mounted onto the front of the leaf vacuums collect up the green waste from the cutter deck and propels it into the collector trailer which has a low centre of gravity making it extremely stable even on hilly ground. A deflector plate on the discharge shoot is adjustable for even loading of different materials. Although this leaf vacuum collector cannot be emptied by tipping it, a web strap anchored at one end, when pulled, removes most of the waste from the vacuum via a large rear hinged tail gate. Wide profile pneumatic wheels greatly reduce markings on soft lawns. 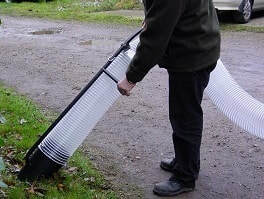 This commercial leaf vacuum can also be used on yards, level tarmac and gravel surfaces. Side discharge cutter decks can be fitted with a 'boot' to accept the collection hose. This leaf vacuum is supplied on a two wheel chassis having suspension units and requires lighting being suitable for road legal use. The hand held suction nozzle is fitted onto a three meter long, 200 mm diameter hose. The discharge is via a metal tube with a swivel base and an adjustable head to allow the direction to be altered. A jockey wheel and 50 mm ball hitch is fitted to this leaf vacuum as standard. The fan belt of this lawn vacuum is driven and not fitted directly onto the crankshaft of its engine. ​Hose: 3M long x 200 mm diameter. Hitch: 50 cm ball hitch standard. The FGTRCLH commercial leaf vacuum collector wandering hose is suitable for the large capacity leaf vacuum (TRCL) and the commercial leaf vacuum (PSU) models. This basic leaf vacuum kit has been made to fit the 156cwt leaf vacuum trailers GWTS15 and GWTX15 with extension sides. Rear adaptor plate to accept the flexible hose from the leaf vacuum. Screw on hooks for the above.